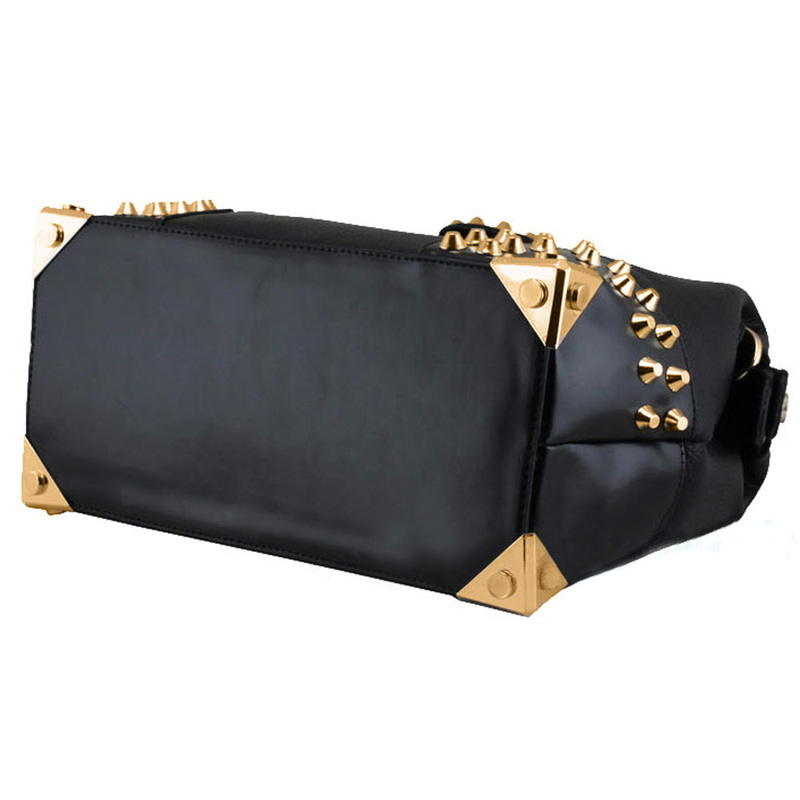 Gothic doctor-style handbag in classic black is perfectly embellished with gold-tone metal studs. Top flap and the bottom corners of the outward-facing side of the handbag, as well as gold-tone metal reinforcements on the corners. The doctor-style hinged metal top closure on this stylish handbag gives the top opening both structure and classic style. Doctors may not make house calls these days, but their signature doctor style handbag is just the prescription you need to stay stylish and prepared when you go out making calls of your own. 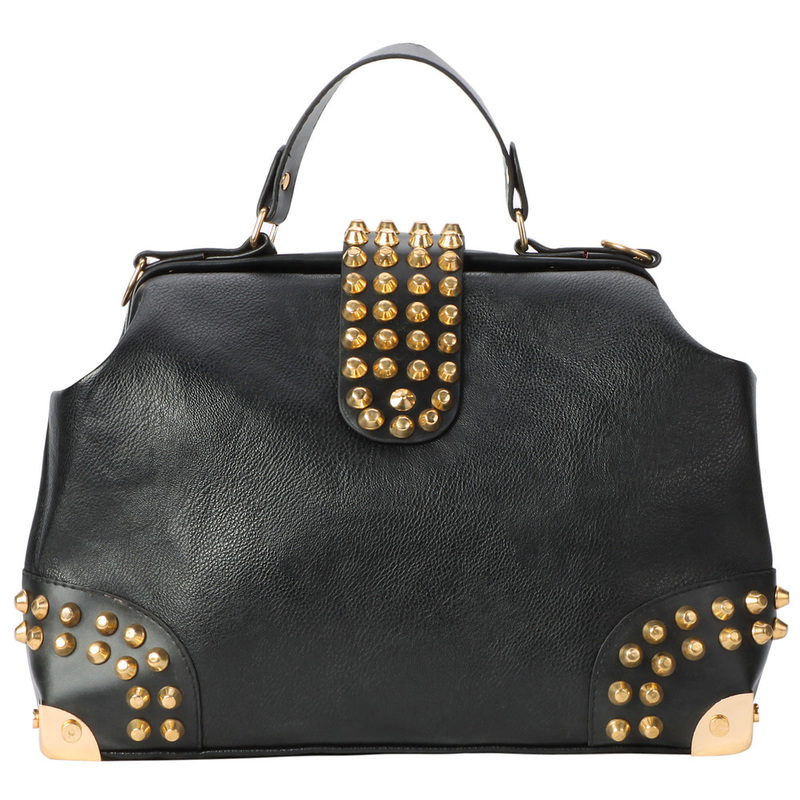 Charming and Gothic doctor style bowler's trademark hinged metal studded opening gives the top of this fashion tote both structure and style. Wide open main compartment makes it easy for you to find what you're looking for inside your bowling style handbag. 2 overlapping snap closures on the top of this shopper tote give you added security and style as well, thanks to the trendy, gold-tone metal studs on the exterior of the second snap closure. 2 open pocket organizers and 1 zippered pouch to hold your smaller valuables and keep them from getting lost in the shuffle. Those stylish metal studs also brighten up the outward-facing corners of this handbag, giving your day bag a bit of sparkle and flash that adds just the right touch to this bags classic black exterior. Gold-tone metal accents also reinforce the corners while giving a bit of added traction to the underside of those corners. Carry this stylish and mod bowler satchel by the single sturdy top handle, or snap on the adjustable and removable strap to convert it to shoulder bag when you wish to go hands free.